Einsiedler (also known as Swiss Anglo Norman or the Swiss Half Bred) are blooded horses horses from Switzerland. They have been in circulation since the tenth century. 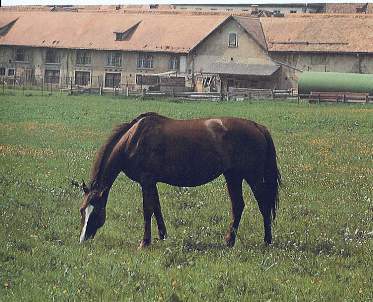 They were developed at the Benedictine Abbey of Einsiedeln with Schwyer Horses, a local stock establishment. Around the middle of the sixteenth century, they founded their very own studbook. They became so popular that by the middle of the seventieth century a new studbook was in rotation created by Father Isidor Moser. They were recreated by utilizing mares of Anglo Norman decent and ones of Holstein roots to formulate a breed referred to as Bracken horses. Some breeders continued their efforts of crossing the blood lines and went on experimenting with Swedish lines as well. These horses survive a rigorous inspection process, with testing at age three and then once more at age five. Einsiedler horses are both beautiful and athletic. They are considered a sound animal with a decent amount of patience. Attractive and strong, they are easy to tend to and noted as being full of life. They are bred in France, Germany, Italy, Switzerland, and Austria. With many uses for them, they can generally be utilized as competition horses for the most part. However, they are also excellent for work horses in many areas.